Orthodontics is the field in dentistry where the focus is on the alignment of the teeth and jaws. 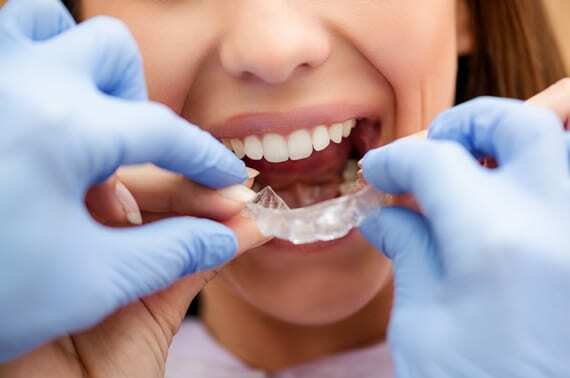 Essentially, problems such as crowding, deep bite, under bite, crossbite, protrusion of teeth, spaces between teeth, as well as many others can be corrected and treated with orthodontic treatment. Our qualified dentists at Emerald Dental Care are passionate about creating beautiful and healthy smiles. We provide all types of orthodontic treatments to suit all patients of all ages. Straightening teeth can help build a confident smile as well as preventing other dental problems such as: difficulty cleaning, decay and gum disease, unusual wear and tear, and sometimes even TMJ problems. Fixed braces consists of brackets and wires. The brackets are cemented to your teeth until treatment is completed. The combination of brackets and wires exert gentle pressures to your teeth, moving them into the correct position. Brackets can be ceramic or metal. Ceramic brackets are less obvious and suit adult patients. These are usually placed just on the upper teeth. Metal brackets are most commonly seen in children and teens. Invisalign are custom made clear aligners made of virtually invisible plastic. These are worn 20 to 22 hours a day and move your teeth gradually to the ideal position. Our experienced dentists work closely with Invisalign technicians to create your smile and every step is mapped out using advanced ClinCheck software. This is great for adults who like to keep track of their progress, not to mention they are removable and most people may not even notice you are wearing them. Clear Correct is an alternative to Invisalign. They are a series of removable clear aligners that move your teeth gradually. Just like Invisalign, your smile is created by your dentist and mapped out on a dental software. Because the aligners are removable, they offer great flexibility as there are no diet restrictions unlike traditional braces. Stop hiding your smile and book in for a FREE orthodontic consultation today!